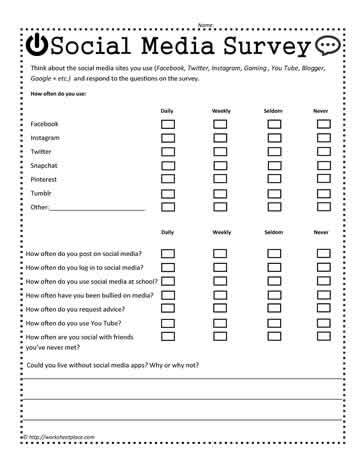 A social media survey for students in middle grades. How often do you log in to social media? How often do you use social media at school? How often have you been bullied on media? How often do you request advice? How often do you use You Tube? How often are you social with friends you?ve never met? Could you survive without social media? Why or why not? A great activity for middle school students.